Organiser: The contest is hosted by The LNM Institute of Information and Technology and co-powered by Facebook Developer Circle: Jaipur. To be eligible for selection in Onsite round,Click Here to Register. Please fill this form after the contest to let us know your feedback about the contest. Additionally, they get bonus laddus (Bonus = n - contest rank) where 'n' is 11 for short contests. Additionally, they get bonus (Bonus = n - contest rank) where 'n' is 11 for short contests. 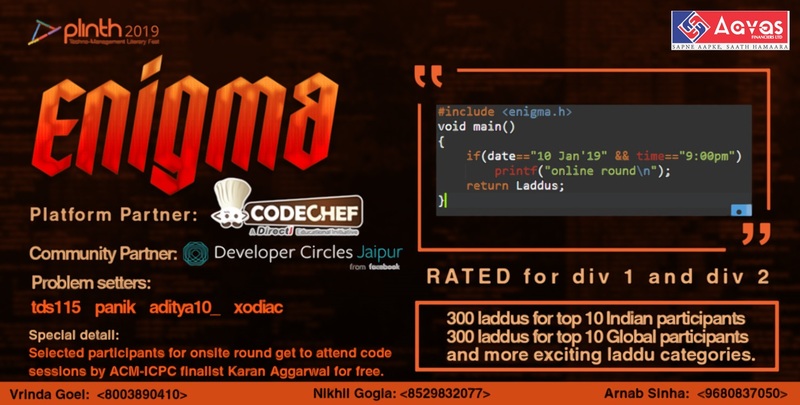 For Onsite Round, Cash Prize worth 20,000 INR and Goodies powered by codechef and Github worth 15000. Total Worth 35,000 INR. Cutoff Rank would be declared after the contest. You just need to have a CodeChef username to participate. No separate registration is required. If you do not have a CodeChef ID create one here. Please contact nihkilgogia@gmail.com for any queries during the contest. 11th Jan 02:57 PM IST: The ratings had been changed after PLET2019 accidentally. It has been reverted back, and the change will be made once JAN19 gets over. 11th Jan 00:45 AM IST: The Plinth-Enigma'19 LNMIIT Techfest - (Rated for all) has ended! In NINENINE When an edge is inserted, no multiple edges or self-loops must form.